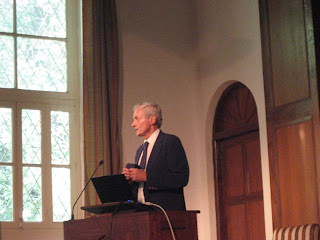 Nearly every presentation went somewhat over its scheduled time. However, we are in India, and everyone went with the flow. After a busy Wednesday lunch (it was also the return of students following Quarter Break, with parent-teacher conferences at full steam in the Quad), we began the afternoon session. The keynote speaker was the eminent George Schaller, whose credentials range from a National Book Award to being a senior conservationist at the Bronx Zoo. 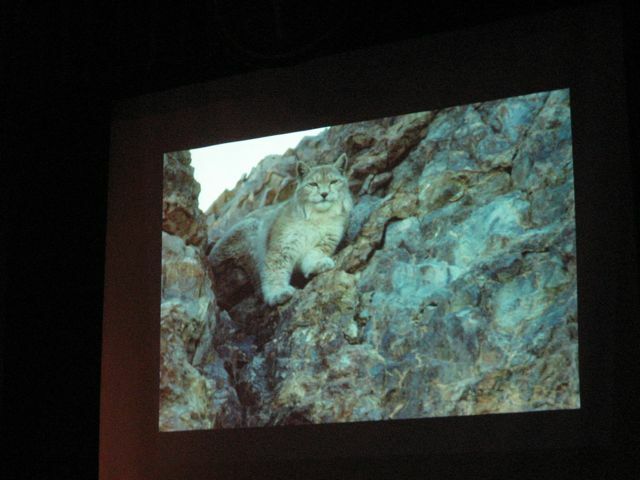 His talk focused on conservation, with special attention to the Pamirs, an area that crosses Pakistan, Afghanistan, China, and Tajikistan, an area where plans are being made for a trans-boundary peace park. 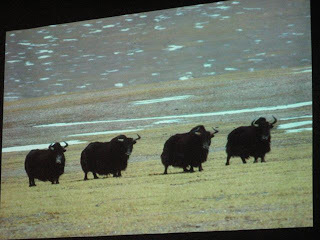 He talked a lot about the endangered Marco Polo Sheep, which have the longest horns of any sheep. George also showed slides of the high Tibetan Plateau. He told us that China has been at the forefront of some conservation efforts – they have put huge areas under protection. They have also built underpasses beneath railroads and motor roads to facilitate migration. The wild Tibetan Antelopes are highly endangered for their wool, which is woven into a material called shatoosh. Because the animals have not been domesticated, they must be killed to obtain the wool. Trade in shatoosh is illegal, but of course there are poachers anyway. He showed a photo of a shawl for sale in the UK priced at over £ 11,000. His final message: conservation is a process. There are goals, but it is never finished.